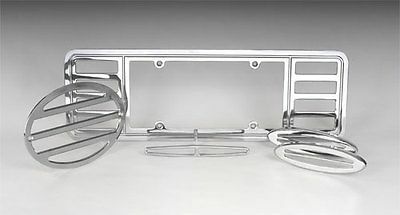 Chrome Louver Set Includes: Tail Lamp Louvers, Third Brake Light Bezel, & Rear License Plate Frame. Dress up the only view of your Corvette your competition should ever see, the rear end. Our exclusive C5 1997-2004 Corvette License Surround and Tail Lamp Chrome Dress Up Kit is manufactured using the highest quality materials, and is sure to make your Corvette stand out among the rest. Our set installs in minutes and all hardware is included that is necessary for installation. Q: What is this product made out of? Q: Does this item pit or rust?